Today, it seems that an S Voice APK was flying around on the interwebs. However, it looks like you have to go through a lot to actually get it to work. First, you’re going to need a Root Explorer. There’s a few free ones out there, and one that costs $1.99. Just make sure it’s a Root Explorer. Then, you’re going to need to download the APK, mount it to R/O (just tap on Mount R/W and it’ll switch it), copy and paste it into system/app (through Root Explorer). Long press the S-Voice.apk and press permissions. You’re going to need to change the permissions. They’re going to need to be: r-w, r, r. Then reboot. After that, go into /system/app using Root Explorer. Install it like you would install a regular app and then ta-da, there’s your S-Voice. If your S Voice app isn’t in /system/app, then just re-do it. Mine wasn’t there, so instead of rebooting, I just installed the app and it works fine now. I’ve heard not to change any default settings, since it will then crash the app. Keep in mind that you’re probably going to need ICS for this to work, and your phone will need to be rooted. 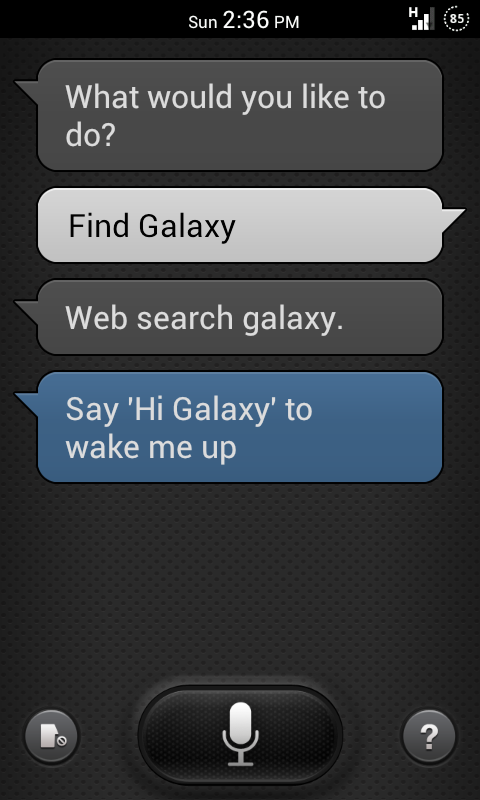 Also, the “Wake Up Galaxy!” command will probably not work. Try it if you want, but you’ll just be talking to a wall. Go here for the download file!